Younger children might be able to join, so please contact the teachers to discuss this possibility, also younger siblings are most welcome. A warm welcome to Shearwater’s Rosewood Cottage, home of the Shearwater Play & Craft groups. The aim of Rosewood Cottage is to provide a sanctuary of truth, beauty and harmony for the children and an oasis of peace and friendship for the parents. The cottage’s environment is created to meet the needs of the very young child. It is a place where the children can learn about the world through their senses and by physically ‘doing’. Their ‘dream consciousness’ is nurtured through warmth, rhythm and a joyful atmosphere. The children feel safe because the environment and the adults surrounding them carry a mood of reverence for this ‘dream consciousness’ through self-discipline and acts worthy of imitation by the children. This is of primary importance in Playgroup. 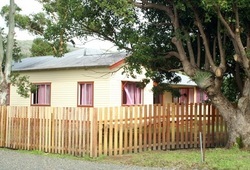 Rosewood Cottage provides a ‘home like’ atmosphere that is ideal for the young child. As well as the physical venue, this is created when the adults care for the building as if it is their own home. Together we will set the table, cut the juicy fruit, clear the table, wash the dishes, sweep the floors, garden and generally care for our Playgroup home. The young child responds well to rhythm and so each Playgroup morning is structured in the same way. As the morning progresses a kind of ‘breathing’ sets in. When the children come to the table for songs, juicy fruit and crunchy bun making an “in” breath takes place. Later, with cleaning up and outside play, a breath “out” and so on. The times of the “in” breaths are times for the adults surrounding the children to bring focused, quiet attention to what is happening for them at that time. The rhythm of the morning also helps the children to know what is coming next and helps to direct and strengthen their will. When the appropriate song is sung for that time of the morning, the children will know that it is time to wash hands, make a crunchy bun or tidy up. The adults set the example for the children. For instance, when it is time to wash hands the parents take their child to the washbasin and together they wash hands. Or, if it is time to pack away the adults slowly and lovingly pick up the toys and place them in their ‘homes’. Because the toys are put in the same place each time the children know where each one belongs. As their learning through rhythm and imitation is very strong, very soon the children will also wish to join in. It is also because rhythm is so important to the young child that we ask you to be on time in the morning. Some children will be ready to join in all activities, whilst others may join in for a little and then need to go. The very little ones may prefer to spend much of the time in the sandpit or garden. All this is perfectly fine. The little ones will join in more as they become ready. We do ask that parents encourage the children who cannot join in to play quietly when they are inside so as not to disturb the mood created inside. We never force the children to participate outwardly before they are ready but we bear in mind that everything is going in and that they are participating inwardly. Monday to Thursday 9.30am to 12.30pm for infants and children up to 3 years of age, accompanied by parents, who attend the whole session. Your day is booked at the beginning of each year but if you need to change please check with us as to availability on another day. Please park in the car park area next to Rosewood Cottage and not on Left Bank Road. If you cannot make it to Playgroup please phone the School or Sonia to let us know. If you are going on holidays, let us know how long you will be away. If you can no longer attend Playgroup, please let us know that you are leaving so that we may invite another family to join in. If you have any questions, concerns or worries, we are happy to arrange a time to speak with you, as it is sometimes difficult to talk at length during Playgroup. Shearwater has a fortnightly newsletter. It is a great way to read about upcoming events in the School and community, so please subscribe to the email version here. The basket will be kept on the inside veranda. Please check it each week. At the end of each term the contents will be taken to the op-shop. Meets at Shearwater, behind Indigo Inspirations every Wednesday morning. Bring along your own craft project or come and be inspired.